The U.C.L.A. trips are an example of what is happening at a much wider scale: A lot more driving. 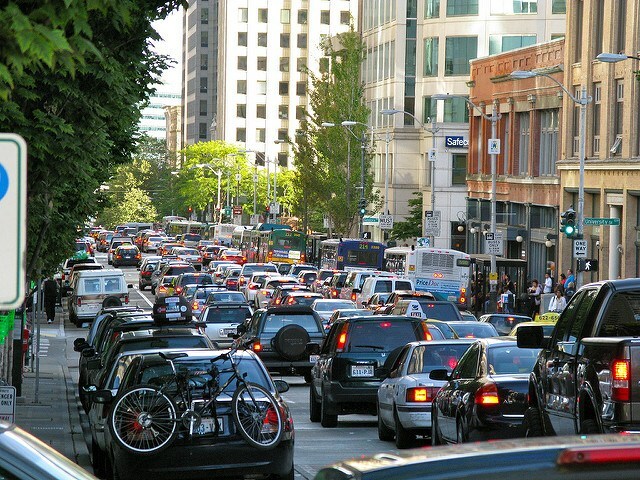 Uber and Lyft, for example, are providing 90,000 rides a day in Seattle now. That’s more than are carried daily by the city’s light rail system, the Seattle Times reports. One study estimated that in cities with the highest Uber and Lyft adoption rates, driving has increased about 3 percent compared to the cities with the lowest. That’s an enormous amount of miles. By the end of this year, Schaller has estimated all taxi ridership will surpass the number of trips made on buses the U.S. The promise of companies such as Uber and Lyft was that they would “free” city dwellers to sell their cars or not acquire them in the first place. And car ownership has declined among higher wage earners. But a University of Chicago study found the presence of Uber and Lyft in cities actually increases new vehicle registrations. That’s because the companies encourage lower-income people to purchase cars, even advertising in some markets how people should put that new car to use — as an Uber. For every mile a Uber or Lyft car drives with a passenger, it cruises as many miles — if not more — without a passenger, a practice known in the industry as “deadheading.” Estimates of total deadheading time vary from 30 percent to as much as 60 percent. Uber and Lyft’s policies make this worse by encouraging drivers to constantly circle to reduce wait times for users, according to John Barrios, the researcher at the University of Chicago, who has studied Uber and Lyft. Transit systems around the nation are losing riders to Uber and Lyft, which suggests that the companies are merely showing the need to beef up transit service across the country. But if you drill down, something else is at work because Uber and Lyft primarily operate in areas that are best served by transit. For example in Seattle, about half the rides taken in Uber and Lyft originate in just four neighborhoods: downtown, Belltown, South Lake Union and Capitol Hill, according to David Gutman at the Seattle Times. These are some of the city’s most walkable and transit-friendly areas. Moreover, according to Schaller, about 70 percent of Uber and Lyft trips take place in just nine American cities: Boston, Chicago, Los Angeles, Miami, New York, Philadelphia, San Francisco, Seattle and Washington, D.C. Meanwhile, traditional taxi service, Schaller estimates, still serves more total trips in suburban and rural areas than the Ubers and Lyfts. Why would Uber and Lyft use be so high in dense, transit-rich areas? Studies aren’t conclusive, but on average, Uber and Lyft riders, not surprisingly, skew rich and skew young. In the top nine cities for Uber and Lyft people with incomes above $200,000 are by far the most likely to use the service. 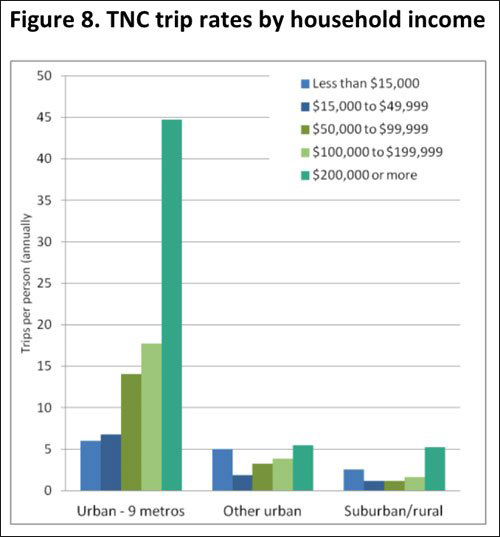 Lower-income people without cars in some less urban markets do use Uber and Lyft, but their use is dwarfed by those with high incomes, Schaller finds. In an ideal world, Uber and Lyft would be making good on their promise to reduce private car ownership because city dwellers would feel more comfortable selling their cars, thanks to the presence of Uber and Lyft. But the data shows that Uber and Lyft mostly “free” people from walking and transit. 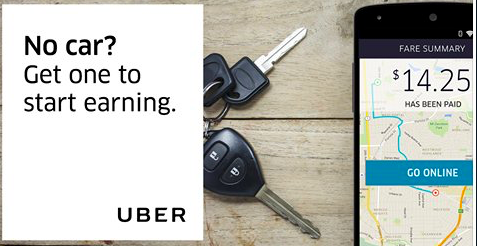 A survey of 944 Uber and Lyft riders by the Metropolitan Area Planning Council in Boston last year, found that 42 percent of riders would have taken transit if the services hadn’t been available. Another 12 percent (like those U.C.L.A students and their 11,000 on-campus taxi rides per week) said they would have biked or walked their journey. Another 5 percent would have just avoided the trip altogether. Uber and Lyft just aren’t competitive price-wise with private car ownership, Schaller said, except in areas with expensive parking. Even with Uberpool and other shared services — which account for a small share of total business, Schaller says — Uber and Lyft increase car miles on urban streets. For each mile of driving removed, they add about 2.6 miles, he estimates. As an added kick in the shins, Uber and Lyft degrade political support for transit. If relatively well-to-do people can hop in an Uber or a Lyft every time the bus or train is late, the political imperative to address the problem is reduced. The wealthier people substituting Uber and Lyft for transit trips have disproportionate political influence. Cities are already capitulating. Last week, Denver partnered with Uber in a last-ditch effort to win back some riders who had jumped to the app. In addition, right-wing ideologues have argued that Uber and Lyft make transit investment unnecessary. The University of Chicago study mentioned earlier estimated that Uber and Lyft increased traffic fatalities last year by an astonishing 1,100 — an enormous human toll. The study also found, surprisingly, that Uber and Lyft have no effect on drunk driving. In addition, Uber and Lyft require basically no safety training for their drivers at all. In fact, the presence of these companies has motivated cities like Toronto to eliminate safety training requirements the city previous required for taxi drivers, in order to ostensibly level the playing field. One qualification with this list: Much of the information we have about Lyft and Uber is imperfect. The two companies make it difficult to study the social impacts of their activities because they jealously guard their data. But Barrios had to use Google search numbers to estimate Uber and Lyft penetration in certain markets because even academic researchers don’t have access to Uber and Lyft’s raw trip data. If Uber and Lyft are honest in their denials, releasing their data could help disprove it. But so far, they have mostly refused. These are just the transportation related drawbacks. To say nothing of these companies treatment of their employees, or the behavior of their top management or their huge financial loses. This piece first appeared in Streetsblog USA, a must-read source for transit news.